"So far best ads tool available"
It is bit heavy and requires more bandwidth. Integrating ads take bit long time. Dashboard can be much better for proper use of functionalities. Some ads are not suitable for old phone as it hangs that phones. We are integrating unity ads in our company applications. It is really useful. Was literally amazing and easy to integrate unity3d ads into our project made in unity3d.Easy to use and helps you make some income eazily with the help of some clicks. Have never tried it to integrate in android studio but have heard from my colleagues that it is a difficult task to do so,I would request unity to solve this issue other than this it is just amazing. I would recommend using unity ads because it is easy to integrate and helps you earn income from the app developed by you. We use unity ads to monetize our applications which we develop using unity3d game engine and it is just easy to do this task and earn some money. Dashboard is nice and user friendly. It is easy to add ads and integrate with our application. One can get enough money out of his app. It is having different ads which is very nice. Overall performance is also very good. It takes bit too longer for integrating ads. Some bigger ads should be removes as it slows down the application. More functionality can be added for better use. "best advertising tool for apps"
It has nice user interface. Ads are new and have a considerable time. One can get some bucks out of their app. Easy to integrate in our app. Also it does not require much data to run. Display functionality is good and user dashboard is also nice. "Great ad service for application"
New ads are provided which many users are seeing. It is easy to select ads and integrate with our application. One can make some bucks out of it. Also the ads are visually good. Hardware requirements are low which is really good. Some ads are too longer for user to see. It also hangs or crashes the application some time. Dashboard can e improved and more functionality should be added. We are integration unity ads in our apps which we build. "Very nice ad service "
Ads are short time and reliable. It is easy to integrate in our app and compatible with our apps. It helps to earn some money out of our apps. Unity interface is very good. New ads are available which are trending. Ads are not lite so it gives load to our app. If the device is running slow app hangs due to ads. After integrating ads i can see some lagging in my app. I would recommend unity to ads for those who wants to earn well from their apps. Some ads are very long and can not be skipped. It requires faster internet connection to load ads. They should improve their dashboard. User friendly dashboard. Ads are quite good and clear. It also consumes less data. It is easy to integrate ads in our app with unity ads and we can add ads quickly. Showing preview of ads is nice. We can earn some cash out of it. Performance of app becomes an issue after integration. Also some ads are stuck in between and we need to close our app. We are integrating unity ads in our app which we create. it is very reliable service. Made monetizing for unity3d as simple as a single click.Unity ads are very much easy to integrate into unity3d.Also gives more variety of ads according to user's location.This are the best things about it. Pays less compared to google ads but can be compromised because of its ease in usage and its not that less. I would recommend you unityads if you are a unity3d developer or else develop apps in unity3d. I use unity ads to monetize apps developed for our company or any other clients.Apps which are mostly made in unity3d are preferred for unity ads. "Amazing for monetizing mobile games"
I have actually experienced unity ads for much time but have no problem with it. 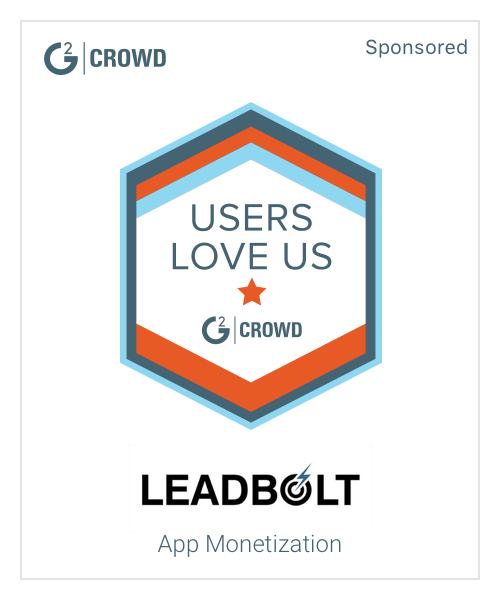 I would highly recommend using unityads for monetizing apps and games developed for mobile platform.It is very easy to integrate and provides on the go support for any queries. We monetize our games and apps developed for mobile platform using unityads. Unity is fantastic. They have some really good services and one of them is Unity Ads. As usual, Unity provides lots of tutorials that you can follow and implement your own Ads solution. You can implement a rewarded Ads in 2 hours or less. You will receive your Ads money after you accumulate hundred bucks. Is not that bad if your game is a successful, however you may not see your money if your game fail, right? Go for it. Is really easy to implement and you can start testing in only some hours. You will enjoy the dashboard that they created. I built a rewarded Ads where the player can play one more life if he watch a full Ad. You can also build your game to show the Ad and let the player skip if he want. Unity Ads will let your game know how many quartis of the Ad the player watched. "Best ads services for apps"
"Great ad service for apps"
Some ads are heavy and give load to app due to which it hangs. Also when ads are running apps crashes or stops. More numbers of new ads are not available. "Very reliable service for earning money from apps "
It is very easy to integrate video ads in it. Developers can earn by integrating ads in it more than they get for downloading their apps. Ads are kept for reasonable time so user does not annoy of ads. Sometimes app crashes while ads are running. Also sometimes ads require fast internet so if not available it is stuck. Gives you full support for earning money by monetizing your apps developed in unity3d.Gives tension free integration procedure by which you can easily integrate its api. Not recommended if you are not using unity3d.because for other app engines this just does't work fine. Surely would recommend if you use unity3d as i mentioned before but if you are using any other thing like android studio,not recommended. I use unity ads to monetize my client's apps rather games which we develop in unity3d because for unity3d you cannot get anything better. The very easy method of integrating unity ads in unity engine is the best part I like about unity ads. Similar to liking part dislikement is also similar,it is difficult to integrate unity ads into android studio or other game engines. I recommend unity ads if you are using unity game engine for developing apps or games but if you are using any other game engine or IDE,unity ads is not suggested for you. I use unity ads for monetizing games developed by my colleagues for out ccompany. "Powerful Ad Manager on Fully Featured Game Engine"
Unity comes with a great feature providing unity ads. Not only Full Featured Free Game engine, unity gives you feature of ads that can easily integrate within your game. Simple, is the first reason why this is good. Second is, ads is always relevant with your game topics, so do not be afraid if you were making a child game a not appropriate ads will appear and ruin your game experience. Other than that sometimes on a good monetizing we must integrade ads more deeply into our game, such as reward coins after watching ads. This feature also can easily integrate within your game. Last thing is managing your ads is easy, even you had a lot of ads in one game. While it has a bunch of features and good things, i think some side need more improvement. Like, you cannot show revenue unless you had five thousand (5000) impressions, this rules quite hard for new released game to see how its ads going. And some people said the payment process is bit difficult, because i hadn't cashed out yet just releasing game. Last thing is, i think this is unity problems. The game size is quite big, a simple hello world game can take 18Mb on .apk file, so bigger feature means bigger size. But on some region or country with modern device, this is minor problems, as the device already had bigger capacity. If you are seeking for fast development and easy ads integration, Unity Ads is the best shot you can get today. While its has a good community, documentation and tutorials are everywhere on internet. Easy, simple and powerful ads on game engine. While its game engine has full feature that can help my game developed fast, ads system remove headache about monetizing. VARIETY OF ADS IS THE BEST PART OF UNITY ADS.YOU GET VARIOUS TYPES OF ADS LIKE INTERSTITIAL,BANNERS AND ALSO VIDEO ADS AND ALSO IT IS SIMPLE TO INTEGRATE. I HAVE NOT YET USED IT FOR MUCH TIME,BUT TILL NOW I DON'T HAVE ANY PROBLEM. RECOMMENDED FOR ALL WHO WANT TO MONETIZE THEIR GAMES. I USE UNITY ADS FOR MONETIZING GAMES,THE COMPANY WHICH I WORK FOR ARE USING THE SAME SINCE MUCH TIME.SO THEY RECOMMENDED ME TO USE THIS AND I AM LOVING IT RIGHT NOW. "Best if you are monetizing unity3d"
Amazing ease of use for integration in unity3d.Simple steps for integrating.Many different types of advertisement categories and much more. Not easily integrateble in other platforms like android studio,coscos 2d. I would recommend using unity ads if and only if you are using unity3d for developing the game which you want to monetize. We use and recommend unity ads for integrating it in apps developed by unity3d game engine because for that its much more easy than any other monetizing platforms. "Best Ad plataform to monetize games"
A lot of great games using it, letting you having a chance to your game appear as a ad of another great game. The support of unity community, that is huge, so your answers will all be responded. For now there not anything that i dislike. The tool made my life easier and allow me to monetize with success my game. If you are using unity, then you need to use unity ads. It´s easy to use, has a nice return, the tutorials are great. They have a lot of types of campaigns. I monetize my games using unity ads. It´s really easy to use, easy to control and has a nice return per view of video or clicks. Easy to integrate is the very best thing about it,other than this varieties of ads provided by unity ads and direct support for unity3d also adds sparkles to this fabulous monetizing firm. In my company we use unity ads very frequently and yet we have not got any problem. Recommended if you want to monetize app/game developed in unity3d. We at our company use unityads to integrate/monetize apps/games for clients,Also some of our apps are also monetized by unity ads. Liked its ease of implementation.I used unity ads first when i joined this company and it took me just few minutes to monetize my first app developed for my client. I actually have something to dislike about it,it is only availible for unity3d and also minimum balance to redeem money is also not good. I would recommend unityads for all unity3d games. We use unityads to integrate ads to our mobile games made in unity3d for our client. "Easiest and best Ad System"
Unity Ads is probably keeping my games alive. First thing about Unity Ads is that its free, big bonus. To implement unity ads you write, get this, ONE LINE OF CODE. Very simple implementation. Unity Ads supports Unity Analytics too. There is only one type of ads, which are Video ads. Also there must be 5000 impressions before you earn any money, which is kind of sad for starter games. Unity ads is 100x better than AdMob, still the best part about unity ads is that you can pair it with ad mob. So you can have unity ads and ad mob. This is the best choice for app developers. I highly recommend it. I have realized that Unity Ads is the best choice for me. Perfect display, easy implementation, great for developing games. "Easy ad solution for unity products"
Unity Ads provides much better recommendations than other competitors. The quality of the ads that are provided is better than competitors, and the interface it uses is more user friendly. When players see unity ads in games, it feels like they were made to be built in, and feels like much less of a hack than other solutions. Web interface is not the greatest website, but is manageable. Limited options displayed to end user gets repetitive, needs a larger base of products to display. Players are more likely to stick around through new ads rather than rewatching old ones. The ads that stay cached on your device take up more space than I'd like, but it's not terrible. This is a great solution for getting high quality ads, but beware the limited number of ads that are displayed. Players notice the repeated ads and are much more annoyed than when getting unique ads. The integration into unity games is great, and is a breeze to setup, especially compared to other solutions. Integrating ads is usually problematic in getting everything setup. Finding nicely packaged solutions is difficult, and the ease of implementing them is also difficult. The time spent implementing these is time taken away from your game. No one does ads in unity better than unity, and on top of that, they provide quality ads. Integration with your unity games works great and is very easy to have up and running in no time. "Not that good, not that bad"
I like how it's very easy to use Unity Ads. Simple clicks in Unity and you're all set. I dislike how at one point they can't serve you enough ads, even though it's quite normal to be able to at that point - maybe because they didn't have enough clients at that time. I would suggest it since it really depends on how well you can implement the ad frequency and how many users you get. I used Unity Ads for few of my games and a recent unreleased one - which we decided to remove since the developer (not me this time) suggested to remove it because "there isn't a lot of money in it". Ease of monetizing in unity3d. Very easy to integrate its sdk in unity3d. Not easy to integrate for other platforms. I recommend it to all developers who use unity3d to develop mobile games,Because it is best for monetization. I use to monetize my games on unity3d. Ease of integration,more revenue,intereactive reporting,amazing dashboard and many other things are awesome about unity ads. Quite less support for integration on other IDE's except unity3d itself. We recommend it to all developers developing games/apps on unity3d. We use unity ads for monetizing and generating revenue from games built on unity3d. "The Ads to support indie development and publish on your own"
I have yet to recheck the updated version of Unity Ads but it has grown from what it used to be thanks to the new updates and features like banner Ad integration. It would also be nice if they had easy Facebook game implementation but of course it would be hard for them to connect as it's a different server. If you want something easy to implement for your mobile games without the trouble for paying it, this is the add-on for you. Do be wary that you need a bit of programming experience to maximize it's capacity! Read up some articles and watch some Youtube videos to get your started really easily. As a developer not into marketing games as much since I'm a programmer into making games and sometimes make my colleagues release things for me, the benefits really are just it's simplicity and easy work arounds you can make to adjust the add-on to your needs. "Unity ads for small games"
How easy it is to add, ads to your games. other software makes it a bit harder to add such things. and its unity so that's always a plus. "Why you should be using it"
In a world where the app store is completely packed, when that one person downloads your app, unity ads can be the only way you can actually make money from it. Can be a bit awkward to set up but otherwise there's not a lot wrong with it. Just try it, its worth checking out especially if your using the engine. With unity ads we had to figure out when to use the ad itself, on boot, after you play a game, after you have a win or lose. the additional funds also help, we tend to of used it for bug testing. "I wish it paid more"
The rates are pathetic, the platform is decent but it doesn't pay any good to developers. Even with thousands of users you earn just a couple of dollars a day. Integrate ads to Android games. Relevant ads, easy integration and ad management and can specify rewards. Revenue isn't shown unless you have at least 5k impressions. Research the web first, or better yet take for a test spin, it's already there. We are trying to solve an non-invasive way of ad implementation without bombarding the player. Unity has made it easy to implement right ou tof the box. "Easy to integrate, great returns"
Unity Ads was very easy to integrate into our mobile app and provides an ample supply of content in all regions. The management dashboard continues to undergo revisions making monitoring and documenting workflows more difficult. Very easy to recommend. Simple integration and excellent content supply. Unity Ads continues to be a leading revenue generator for our applications. "Use experience of Unity Ads"
* We monitor all Unity Ads reviews to prevent fraudulent reviews and keep review quality high. We do not post reviews by company employees or direct competitors. Validated reviews require the user to submit a screenshot of the product containing their user ID, in order to verify a user is an actual user of the product. Hi there! Are you looking to implement a solution like Unity Ads?